Though “panini” translates, loosely, to “sandwiches” in Italian, the word might as well mean “often underwhelming.” At most American lunch spots, the panino is nothing more than your traditional meat-and-cheese sandwich, toasted, and marked up an additional two bucks (for the grill marks, maybe?). 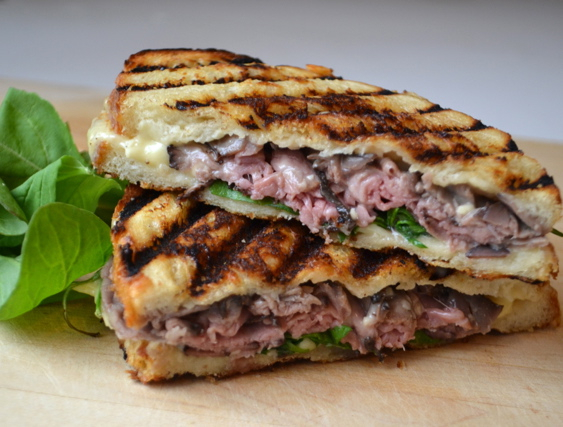 Instead of suffering through another lackluster grilled sandwich, perfect the panini yourself. Chef “Bobo” Ivan has at his Santa Monica, CA, restaurant, Ciboteca, where his menu is stocked with more than 15 carefully constructed paninis. Ivan recommends grilling up a veal Milanese panini, which acquires heartiness from pan-fried veal shoulder, sharpness from whole-grain mustard, and gooeyness from Parmesan cheese. A toasted ham and cheese sandwich, this is not. 1. Arrange the breading stations. Spread the flour on a large plate. In a separate large, shallow bowl, gently whisk the eggs with a pinch of salt. On another large plate, add the breadcrumbs. 2. In a large skillet, heat the canola oil and butter over medium until the butter melts and begins to bubble. Season the veal on both sides with salt and pepper. Working with one piece of veal at a time, coat the piece in the flour, then the egg wash, and then the breadcrumbs. Shake off any crumbs and then add the veal to the skillet. Cook until golden brown, 2 to 4 minutes on each side. Place the pan-fried veal on a plate lined with paper towels. 3. Spread 1 Tbsp of mustard over both halves of each ciabatta. Arrange the mizuna or arugula on the bottom half of each ciabatta. Top with a piece of veal each, followed by 1 Tbsp each of Parmesan. Close the sandwiches and place them inside a Panini press preheated to 300°F*. Grill the sandwich until golden brown, about 4 minutes. Remove the sandwiches, cut each in half and serve immediately. Makes 2 sandwiches. *Don’t own a Panini press? Place the sandwich in an oiled skillet over medium heat and place another heavy skillet on top. Boom! Instant panini press! Just remember to flip the sandwich halfway through cooking so both sides are well toasted.